When you get a toy gun, you’re going to want to shoot something, sooner or later. There’s only so much fun in seeing how far it will shoot. People and animals aren’t an option for various reasons, up to and including eye damage, so many of the toy guns you can get come with targets to shoot at. 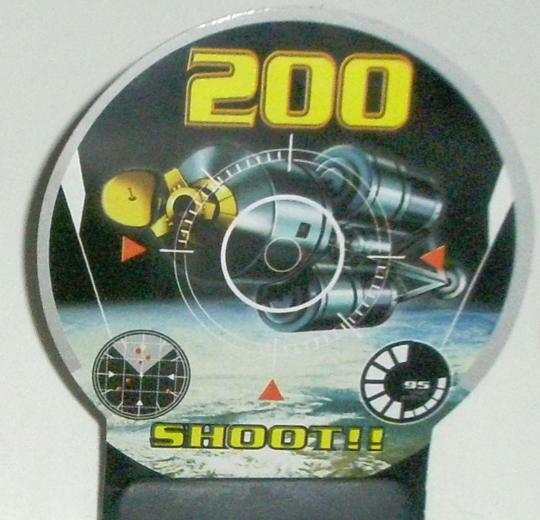 Summary: This target is a target that spins horizontally when shot and is made with hard plastic with suction cups on the stand to stick to a surface. The enemies are stickers on the plastic surface. If you can get the suction cups to stick to a surface, the target should spin fine and the darts might stick, otherwise you’ll need to tape the target down. 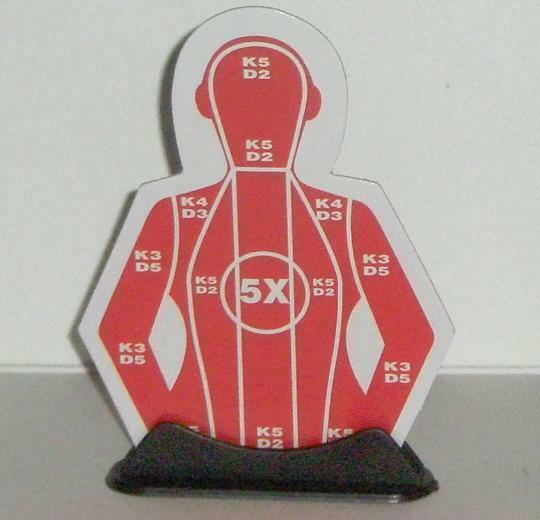 Summary: This target is a flat piece of cardboard placed in a plastic stand. 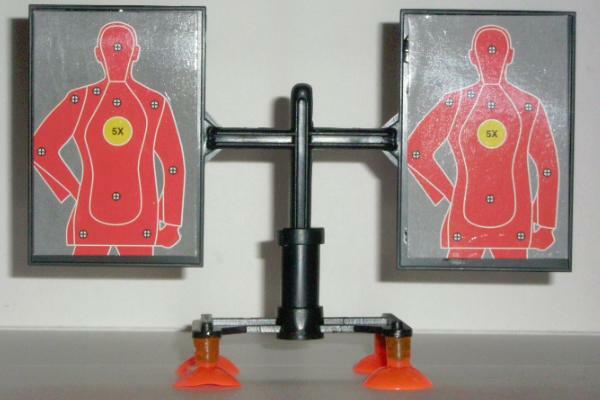 The surface of the cardboard shows the torso of a person divided into sections, each worth a different amount of points depending on where the target is hit. When hit, the target will most likely fall back, unless it is held down in some way. If the target is held down, the dart might stick, but the cardboard is flimsy and most likely won’t take many hits before breaking. It’s your choice, but it’s not that big of deal. Summary: This target consists of a cardboard target in a black plastic stand to hold it up. The target shows what looks like a Heads Up Display(HUD) of a space fighter ship targeting some from of module in space. It can be taped down, but there’s little point since the target comes with a plastic bullet firing gun. The bullets won’t stick so it’s better to have it knocked down so you know it’s been hit. It’s worth 100 points, but up to you if 100 for every hit or not. Con: Are you just floating in space shooting at it? 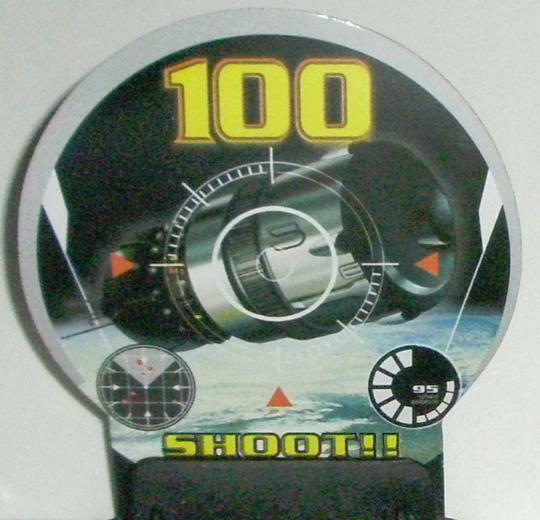 Summary: This target also consists of a black plastic stand and a cardboard target. The target also shows the HUD display of a spaceship that is targeting another spaceship. This is a knock down target and it’s better for the target to allow it to be knocked down instead of taping the target down to allow it to stay standing. This target is worth 200 points, but you’ll probably have a hard time hitting it from anything other than point blank range. Con: Again, are you just floating in space shooting at it? 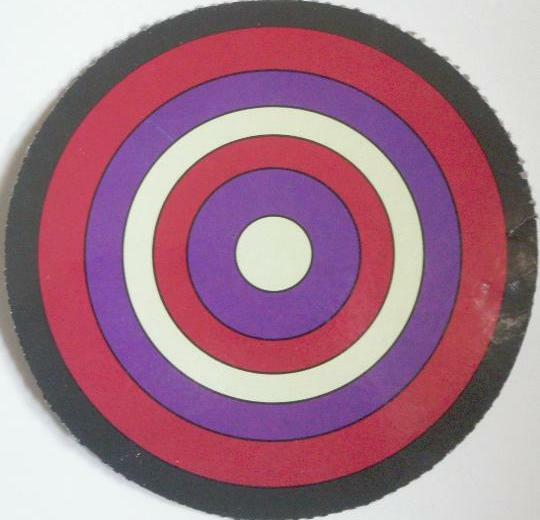 Summary: This target is a typical archery bullseye target and it needs to be cut out of the dart bow and arrow cardboard. It doesn’t have any stand so it would need to be pinned/taped to a wall or some other creative way to have it held up to shoot darts at it. The target would need to be fastened to something completely flat and firm if the targets have any hope of the darts sticking. Points can be discussed ahead of time since the targets lack scoring, unless the rules change as you go. Summary: This target is similar to a dartboard, but it’s a little more wacky and thus, quite lame. It needs to be cut out from the dart bow and arrow cardboard package and it doesn’t have a stand either. It needs to be fastened to something flat and firm in order for the darts to have any chance of sticking to the target. As a dartboard, there are numbers on several sections, but the placement of the 17,18 and 19 conflict with the usual scoring. They should have just left those off.